A Gaussian Mixture Model (GMM) models data as a finite mixture of Gaussians. It is often used to perform clustering. In this case, the number of Gaussians is the number of clusters and is initially selected. Compared to -means, GMM allows clusters with uneven variance and density. Parameters are usually estimated using an Expectation-Maximization (EM) algorithm, its aim being to iteratively increase likelihood of the dataset. GMM is actually a perfect model to understand how EM is working. Fig. 1. Clustering a 2D dataset into 3 clusters using GMM. Left: Dataset before clustering. 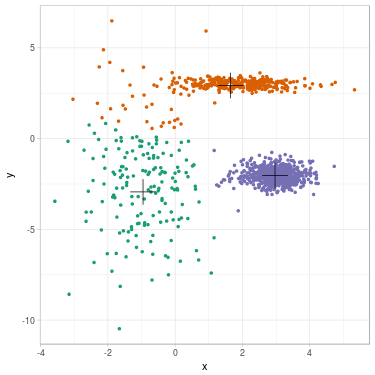 Right: Clustered data with position of fitted mean for each Gaussian. We begin by describing GMM and list parameters of the model. We continue by applying EM to GMM and derive update formulas. Then, the algorithm to cluster data is given. We finally illustrate the clustering process on a simple example. This post does not detail how EM is working. If you are interested about theoretical considerations, please read this post. Let a dataset of . Each conditional variable follows a Gaussian distribution with mean and covariance matrix . However, this log-likelihood function is non-convex (as a function of ) and direct optimization is intractable (see this post for a discussion). We introduce EM to circumvent this problem (other methods could work, see this post for a discussion). 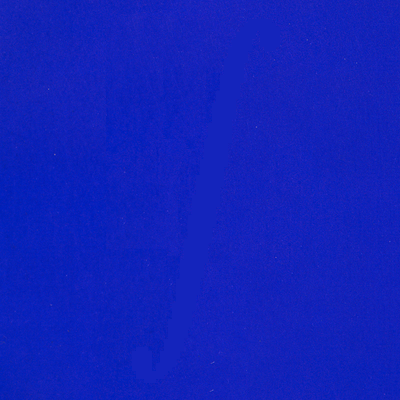 We assume that some parameters have been selected (for a certain ). We would like to update parameters and find out using EM algorithm. From this shape, we can separate maximization of each couple (for ) and maximization of the set . Conclusion: We select and is maximized in . From previous expression, we can also perform maximization of for each fixed . Let’s do the most simple computations (seeing as a vector of length ). And if and only if . which is a negative-definite matrix. Conclusion: We select for all and is maximized in . Let a dataset of and an integer. some initial positions obtained with -means. Let the density function of a Gaussian with parameters and on . We repeat this step until convergence (see this article for theoretical results of convergence). In general there is no problem for convergence to a local maxima, however it is possible to build some pathological cases. We propose to cluster a two-dimensional dataset into 3 clusters using GMM. The dataset is plotted in Fig. 2 (a). We initialize parameters with -means (related clustering shown in Fig. 2 (b)). We update parameters (see Fig. 2 (c) for clustering related to ) until convergence (see Fig. 2 (d)). Fig. 2. Clustering dataset into 3 clusters using GMM. 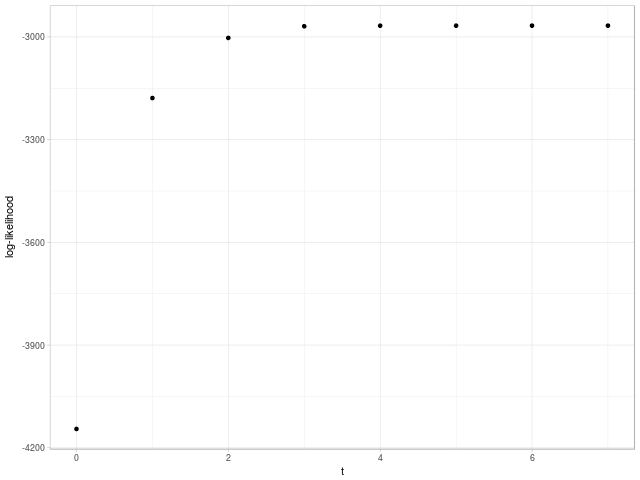 From left to right: (a) Dataset before clustering; (b) Initialization with K-means; (c) Step 1; (d) GMM clustering after convergence. On each figure from (b) to (d), one color represents one cluster, and mean position of each cluster is represented with a cross. We summarize evolution of the parameters along steps. Cluster 1 is the green one on the left, cluster 2 is the orange one on the top, cluster 3 is the purple one on the right. Likelihood of the dataset has increased from to after convergence. In this case, EM algorithm has reached MLE. Evolution of likelihood as the number of steps is shown in Fig. 3. Fig. 3. Evolution of likelihood as the number of steps until convergence using EM algorithm. Note 1. Dataset has been simulated as mixture of Gaussians, where true means for clusters are , , ; true matrices of variance-covariance are , , ; and true proportions are , and . The likelihood of the set using true parameters is . Note 2. Since we are using -means for initialization, it may be useful to normalize data before using GMM clustering. An article detailing parameter convergence results for EM.